Starting the end of last week property owners began receiving via e-mail and/or regular mail the paperwork for the vote on the proposed clubhouse as well as the absentee and/or proxy ballot for the annual HOA board election. Both issues are very important to Timberwood Property Owners. Please give serious consideration whether you believe the vote regarding the proposed clubhouse should be for or against. Given the lack of detail, plans, firm budget, design information and so much more that has not been provided thus far as well as the lack of existing funds to pay for this major project in our operating accounts it seems ill prepared for a vote at this time. This is an extremely large decision and if financed as the proposal outlines without much in specifics, property owners are borrowing money which should not be necessary to borrow via our HOA. If due diligence, proper fiscal management and planning had been done for the last 5 years that this current HOA board has been at the helm there could easily have been a large percentage of the funds saved for this large-scale project to be undertaken without financing obligations. There are instructions about how to return your ballot and for this vote included with the packet you received in the mail. A proxy ballot cannot be used for the clubhouse issue. Please be sure to follow the instructions and return it by the deadline which is November 15, 2016. Property owners also received proxy/absentee ballots via e-mail and/or regular mail. This ballot is separate from the clubhouse vote. For this ballot, you can provide your ballot to another property owner allowing him or her to vote on your behalf by proxy should you wish to do so. Or, you have the option to turn in an absentee ballot by December 1, 2016. Please be sure to read all the ballot options to ensure you get the option you are wishing to participate with. If your neighbor is taking your proxy to the meeting, please be sure that he or she is attending the annual meeting. Otherwise, your vote will be wasted. Questions? Feel free to comment back to admin@timberwoodparksa.org ! The October HOA meeting raised more questions than answers when it comes to the “proposed clubhouse project”. The meeting started with a discussion about meeting rules and how discussions would be handled in the future. 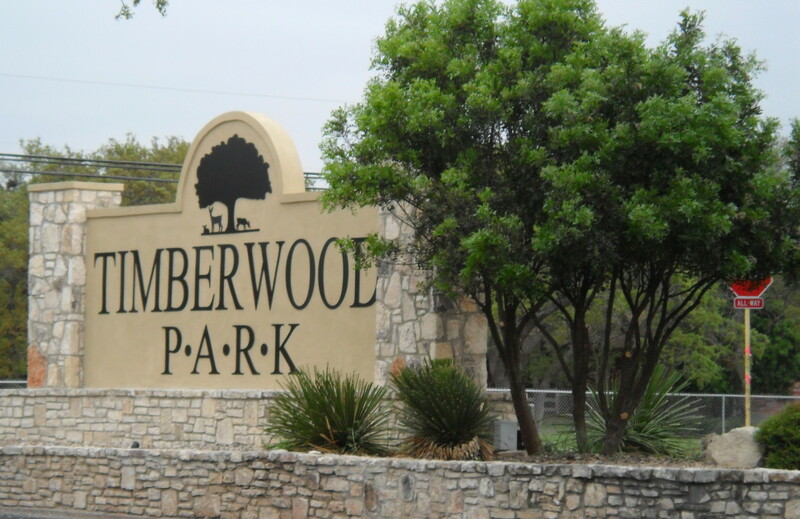 The President provided an overview of a one-page document which was left out as a handout for dispersal to property owners attending entitled “Timberwood Park Homeowners Association Meeting Code of Conduct”. It outlined 11 items describing how the HOA meetings would be handled in the future, particularly with regard to open discussion by members with the board on matters of importance to them in the neighborhood as well as those items which were or are under consideration by the board. Further, discussion continued by the board that the 25% down payment then allows financing to be obtained because that is what most financial institutions require in order to get financing for capital projects. A couple of other line items jumped by a large number from the budgeted 2016 numbers and were discussed for a brief time before the board voted the budget approved. Discussion then turned to the clubhouse vote. The president spoke about the upcoming paper ballot vote which will take place to either approve or deny the project. He noted that while the board did not need to seek permission from the property owners to proceed with this project, the board had decided there was enough interest and differing opinions about it to warrant a vote by the community. The hard copy October newsletter issue outlines the generalities of the process for this vote to take place. It notes, under the President’s column, that the ballot for the clubhouse vote will come out in the mail around October 24th. The vote on the clubhouse is separate of the election proxy ballots which will also be arriving around the same time. The article states to read each ballot carefully and follow the instructions carefully. There is a different deadline to return the clubhouse vote than the proxy ballot vote for the annual board member election. There is only one vote per household as has always been the case. There are no proxy votes allowed on the clubhouse project so if you wish to participate in the vote on that matter you must send back in your paper ballot to Spectrum who will tally the votes by the end of November (according to the hard copy October newsletter article) and the board will announce the results of the clubhouse vote with the community. Here’s where it gets a little more confusing, and I was in attendance at this meeting. There were many questions in the audience about this process since we, as a community, still have nothing official in costs, design, how we fund it, etc. to base this large decision on. We have been presented with lots of ideas and generalities, but nothing of substance or concrete. Discussion began with a property owner asking how a decision of this magnitude could be made without any due diligence being provided by the board to the property owners and community. Further, why didn’t the board just approve a figure like say $25-35,000 to complete research and provide due diligence before asking the community to make such a large decision? The board countered back that this was not giving the board carte blanche but rather allowing the project to move forward. A property owner question was asked whether this vote would be binding – in other words a vote yes means we move forward and build no matter what is discovered down the road, versus no which stops the project. The President responded yes… it is binding and means we go forward. Questions were asked by property owners whether there would be some financial details provided, like for example – – 3 budgetary options outlining choices, or remodel vs new build, etc. The board answered no, this was just a vote to move forward yes or no on the clubhouse. A property owner commented that he didn’t feel this was good business practice to vote the board to proceed without basic solid information in place and suggested that the board bring the community back into the process once they had real numbers and details to share not speculation. The board stated the clubhouse would not happen overnight that it would be 6 months just to get the information to proceed. The board then shifted the discussion about the $187,500.00 figure stating it would be used to secure permits from the City, architecture design fees, etc. Wait a minute, not 10 minutes before, the budget approved by the board indicated this figure was a 25% down payment for a $750,000.00 theoretical price of a new clubhouse. So, which one is it? A property owner stated he felt that the project was not well enough discussed, nor enough detail provided to make an informed decision, much less vote an approval or denial. Another property owner stated that we should just trust the board to make the right decision without further detail provided since we elected them. Several property owners discussed the lack of detail and the lack of information and that this made it difficult to vote the issue effectively. The board indicated it had already spoken with two architectural firms on design and other details and a property owner asked for the names of the architectural firms which the board indicates they have been working with to provide them with some initial detail. The board refused to state the names of the firms. Why? What’s the big secret? There isn’t enough serious detail provided to be comfortable with voting this sizable issue at this time. The board says one thing, then restates it — like the $187,500.00 figure they approved for 2017 budget and what its purpose is for. First it’s a down payment for a $750,000.00 clubhouse which we don’t have money saved for and will be financing. Then during the discussion that evening, it becomes the fund to pay for the ground work to build the clubhouse — permits and design fees, etc. In my business experience, design firms typically will provide much initial product and proposal without cost in order to gain the eventual business — so I would not believe it essential to pay for design work initially. Further, unless you are actually building, why would you pay for permits, etc.? Why do we need to finance it? Why the rush to build it/remodel it? Why not save the money for whatever the project becomes before we take it on? As property owners we all count on our elected officials to do what’s in our best interests. That’s one of the biggest reasons we elect them to their positions. We also put ourselves on autopilot once we elect and assume that the right choices will be made on our behalf because we all have busy lives and have many, many things we are all involved in which demand our attention. This vote is a serious matter and every property owner should pay close attention to what they are being asked to vote for when they cast their vote and turn it back in. Please give it your attention and provide a well thought out vote back when you receive the ballot in the mail. TIMBERWOOD… MEET THE HOA CANDIDATES AND FURTHER CLUBHOUSE DISCUSSION HOA MEETING!! SHORT NOTICE!!! HOA MEETING TOMORROW NIGHT!! TIME CHANGE — 6 PM START TIME – BE SURE TO BE THERE!! Property owners interested in meeting the candidates running for the open spots on the HOA board this year should plan to attend the HOA meeting scheduled tomorrow night, 6 pm, Tuesday, October 4, at the clubhouse! The time change was done to accommodate anyone holding a National Night Out event later in the evening. NOTE: The Time Change — 6 pm start time!!!! Hear candidates introduce themselves and speak to the audience! Additionally, there are other agenda items including further discussion about the proposed clubhouse project. If you are interested in the upcoming HOA election as well as the proposed clubhouse project, please plan to attend!! !